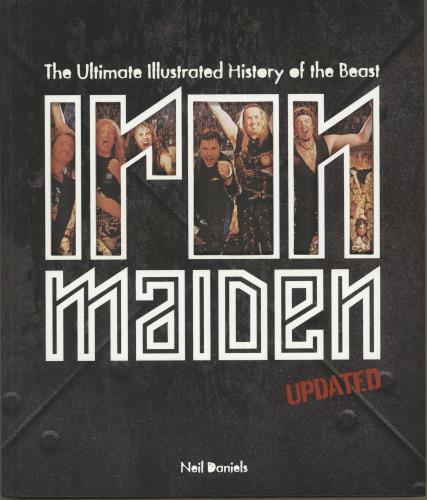 IRON MAIDEN Iron Maiden: The Ultimate Illustrated History Of The Beast (2017 US Updated Edition 240-page hardback book by Neil Daniels. Formed in 1975 by East London bass player Steve Harris, Iron Maiden went on to become one of the most successful heavy metal acts in history. Features the stories behind the band's formation, roster changes, recordings and tours, complemented by nearly 500 images, including live performance and candid off-stage photographs, memorabilia and Eddie, Iron Maiden's iconic mascot, created by Derek Riggs. With superb die-cut 'IRON' picture cover).